One of the most recognizable Ancient Egyptian monuments is the obelisk. Although architecturally simple, its towering height has always had the projection of power and culture. Obelisks from Ancient Egypt have been migrating from Egypt ever since the days of the Roman Empire up to the 19th century. In this article, we attempt to track down the more important obelisks from around the world. If you`ve ever visited Istanbul, Turkey, you`ll notice an Ancient Egyptian obelisk tucked next to the Blue Mosque. The first question that comes to most people`s mind is: how in the world did an Ancient Egyptian obelisk ever get here? Our first obelisk was erected by Tutmoses III (1479-1425 BC) in Upper Egypt. It remained there for nearly 2000 years up to the later years of the Roman Empire. Emperor Constantius II brought it to Alexandria in commemoration for his 20th year in power in 357AD. In 390AD, Emperor Theodosius I decided to transport it to Constantinople in his honor, where it found its final resting place. Today, this obelisk is known as the Theodosius obelisk and stands prominently in the historic square next to the Sultanahmed Mosque (otherwise known as the Blue Mosque). For centuries, obelisks have pretty much remained in Egyptian soil, standing where they were originally intended to be. In the early 19th century, Muhammad Ali Pasha, the founder of the modern state of Egypt, viewed obelisks as a lucrative commodity that he could trade with the West in exchange for technology and political alliances. 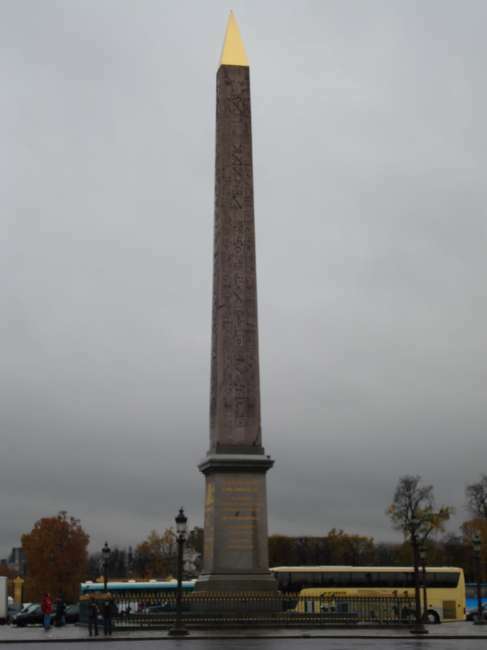 In 1829, one such obelisk was transported to France under King Louis Philippe, who has placed it in Place de Concorde, Paris after spending 3300 years in Luxor, Egypt. In exchange for this obelisk, Muhammad Ali Pasha received France`s latest technological marvel, a highly accurate clock tower, which he promptly placed in the Muhammad Ali Mosque square. Given that the clock tower never worked, the French probably got the better deal! The obelisk golden metal top was added in 1998. Another well known obelisk, is known as Cleopatra`s needle, which stands in the heart of London along the Thames River. It was originally erected in the Egyptian city of Heliopolis on the orders of Tuthmosis III, around 1450BC. The inscriptions were added by Ramses II 200 years later to commemorate his military victories. The obelisk was later brought to Alexandria and setup in the Caesareum, which was a temple built by Cleopatra in honor of Mark Antony in 12BC (along with two other obelisks). After a series of earthquakes, the obelisk later toppled, buried underground, and was never touched until discovered by archeologists in 1877. After a long, difficult and expensive voyage, the obelisk finally made it safely to London where it was erected by the River Thames opposite of the London Eye on 1878. Our final obelisk is the Obelisk at Central Park (also known as Cleopatra`s Needle). It is the second of the three obelisks brought to Alexandria and setup in the Caesareum in 12BC. It was shipped over to New York from Alexandria, Egypt in 1880 aboard a steamboat in exchange for increased trade with Egypt. Upon its arrival, the obelisk became a center of Freemasonry ceremonies. It is estimated that over 9000 Freemasons paraded up 5th Avenue to commemorate the arrival of the obelisks, with over 50,000 spectators. Today, there are thousands of obelisks around the world. Some of these were built by the Ancient Egyptians, others were built much later to mimic the structure. Through the use of obelisks as trading devices and political bargaining chips, the Egyptian monarchs in the 19th century inadvertently made the obelisk a symbol of power and culture in the Western World. Today, most of the world`s Western capitals contain an obelisk. The Washington Monument, in Washington D.C., for example, is in effect an obelisk.